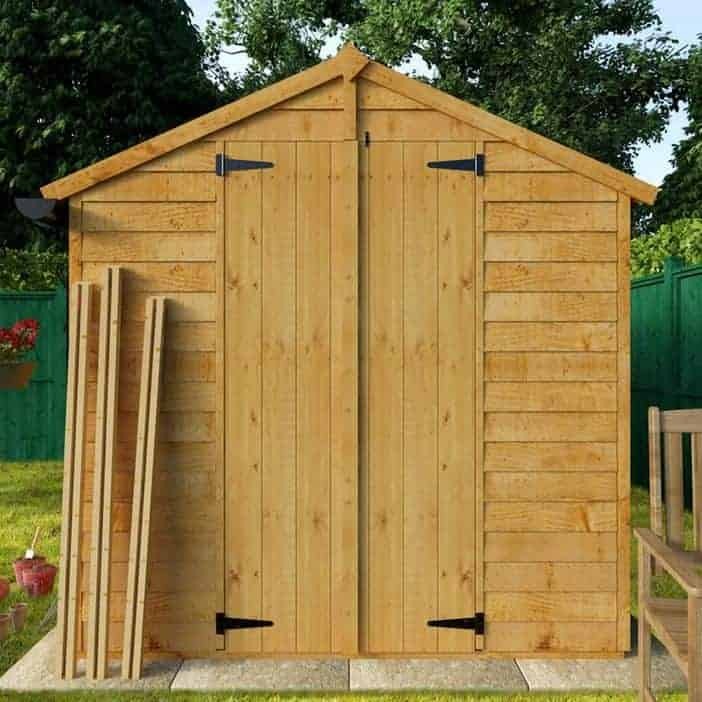 Here we have a value shed that has some good aspects as well as those that are not so good. You don’t get tongue and groove cladding, for example. 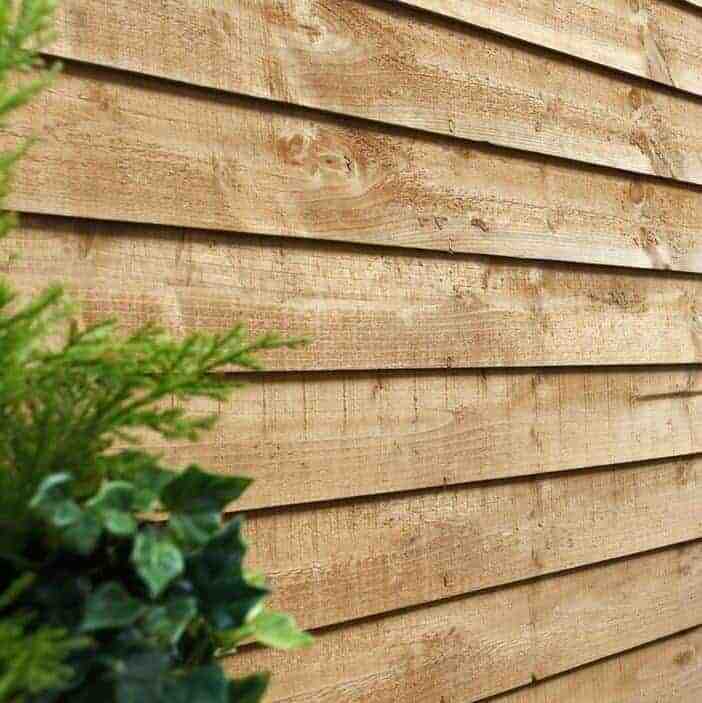 While overlap cladding looks lovely, with a rustic feel, it will need regular and careful treating to go the distance. Two very good quality windows are in the building. They are fixed, and provide an excellent amount of light to the interior. But perhaps the very best aspect of the building is the fact that the manufacturer has decided to include double framing. This is a very high quality approach to framing, and it is excellent to see it in a value building. 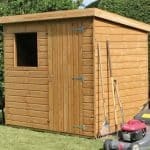 A good all-round shed for a budget price. 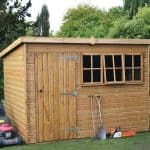 We were surprised by the inclusion of double framing on a budget shed. No security measures at all. It is recommended that you buy your own padlock set to rectify this. Overlap cladding is not the best. It looks good, but you will need to treat it to get the most out of it. This is an economy shed, and it has an attractive apex roof. This immediately gives it value because there is more head height in the building. 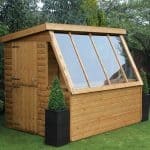 It also means that you have a shed that has better defences against rainwater. Rather than gather and cause a nuisance, water will just run off because of the slant on this roof. When it comes to size, you have a building here that is 202 cm wide. The building goes back quite a way, with a depth of 238.8 cm. As you may be aware, the measurements change a little inside a building, and this is because buildings have walls that are of a certain thickness. That thickness reduces internal measurements. So with this building this means an internal width of 181.4 cm and an internal depth of 234.4 cm. It is an economy building, and this means there are small sacrifices you have to make in quality. The roof is crafted from solid sheet material. This is not the strongest material you can have, but for this price it is a strong option, and allows for ample rain protection. That protection is boosted by the felt covering that is supplied. All in all, while this is not the best roof arrangement in the world, it is certainly useful, and is good value. The manufacturer has given you overlap cladding. This is good quality cladding for the price of the building. And it does a very effective job of keeping rainwater out. The only catch here is that you have to be absolutely on top of treating the cladding every year, because if you don’t it can fade and crack. As it stands, it does a very good job of keeping out the rain, with the added bonus of presenting a lovely rustic appearance. Real value is presented in the double framing that BillyOh has provided. This is very strong, and will help keep the sturdiness of the building for years to come. It won’t suffer in bad weather, so you’ll have a nice solid feel to the building. We like this feature, because it shows that BillyOh is trying to make sure it gives value. You certainly don’t get double framing in every building, so it is a nice aspect. The best news in this area is the floor, because you get good options. You don’t get a floor with the building. If you can fit your own floor this is no problem. But you do get two choices, one for solid sheet flooring and one for tongue and groove. The solid sheet is a perfectly hardwearing floor, but over time it may suffer a little if you have plenty of footfall or want to store heavy items. We think it’s best to pay a little extra for the tongue and groove option, because this will pay off in the years to come in terms of solidity and durability. Tongue and groove is very strong, because timber is locked together to combine strength. This makes sense with flooring, especially if a building is used a lot. No treatment has been applied at the factory. You need to be aware of this, especially as you have overlap cladding, which would not last as long untreated as tongue and groove would, for example. Get it treated as soon as you get the kit home, and then ensure you treat it annually. Not treartig it simply means wear and tear and a shorter lifespan. You get two windows with this building. They are fixed, and you need to bear that in mind because this means you need to use the door for ventilation. However, they are of good size and work hard to bring in plenty of light. It’s a pleasing feature, and it adds more value as you are able to enjoy the building with natural daylight. There is nothing in the way of security here, not even a small turn button. We recommend that you remedy this immediately as soon you take delivery, and invest in a good solid lock. As well as the flooring you also have the opportunity to purchase a base, or just bearers. Having just bearers is fine, but you will gain maximum benefit from buying a full Eze Base from the company. This is easy to put down, and it sets you up for the future, with a strong base that lifts the shed off the ground. If, like most people, you’re going to be placing this on grass, it makes perfect sense to have it lifted. Wet grass does not help with damp. You can choose to have shelving fitted too. 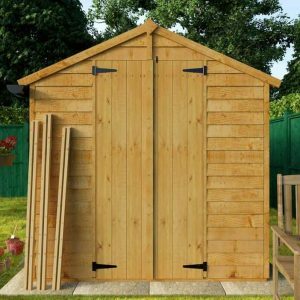 This is an absolute essential in our eyes, because we think shelving for a compact shed like this one really adds massive value in the way of storage. To add that personal touch, buy paint in the colours the manufacturer offers. They are all vibrant and fun, and allow you to make your own mark on the building. 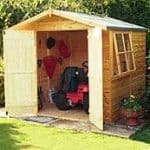 Although the manufacturer has been clear this is an economy shed, there is still a feature or two that makes it a better than average purchase. 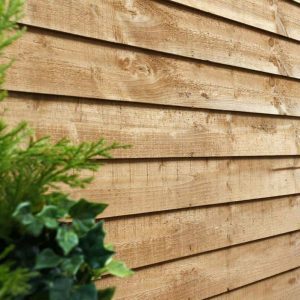 The cladding is not as poor quality as you might expect for this price, and it will do a very good job of keeping rain out. And don’t forget that framing, which is a real bonus, and not expected in our experience. We were also pleased to see two good quality windows. Buy that base and you’ve added to the longevity immediately. The roof and felt will help keep the interior nice and dry, but we do recommend that you go beyond base model specification and purchase that base. And you will have to treat it annually. This is a non-negotiable. It’s compact, but still large enough to store larger tools and equipment. Add the shelving as an extra cost and you instantly have a much more practical and useful building. Compact and manageable, you should have this up in a couple of days. The treatment takes time, as does the painting if you intend to go down that route. 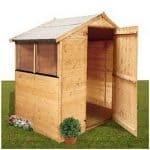 This is a value shed, and this is reflected in the price. For what you pay, it is a handy storage building that needs some care and attention over time. Beyond the base spec, we recommend shelving and other options to make it a truly useful shed over the years. 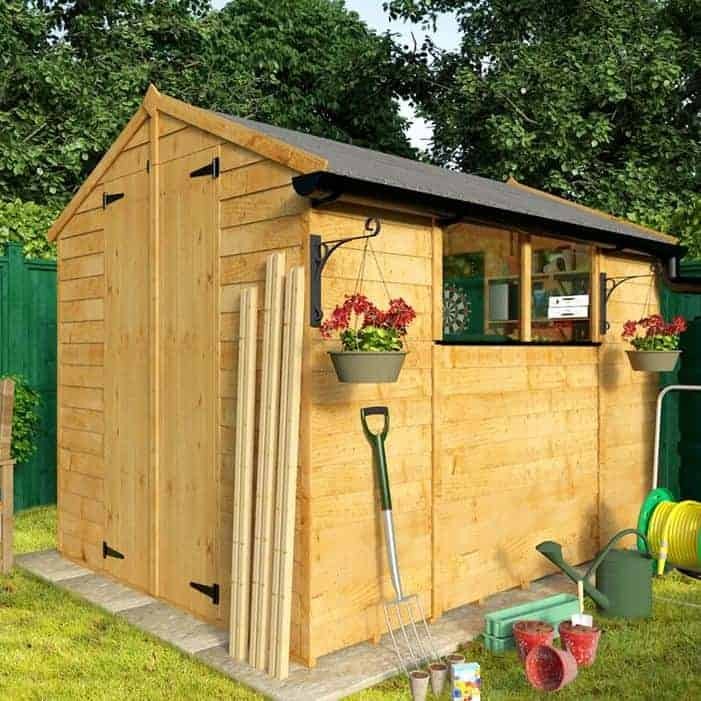 Final Thoughts: This is a perfectly capable little shed, and we like a number of features here. 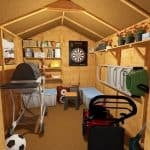 We thought the inclusion of windows really lifted the interior of the building, and made for a much more pleasant experience than we usually find in budget sheds. 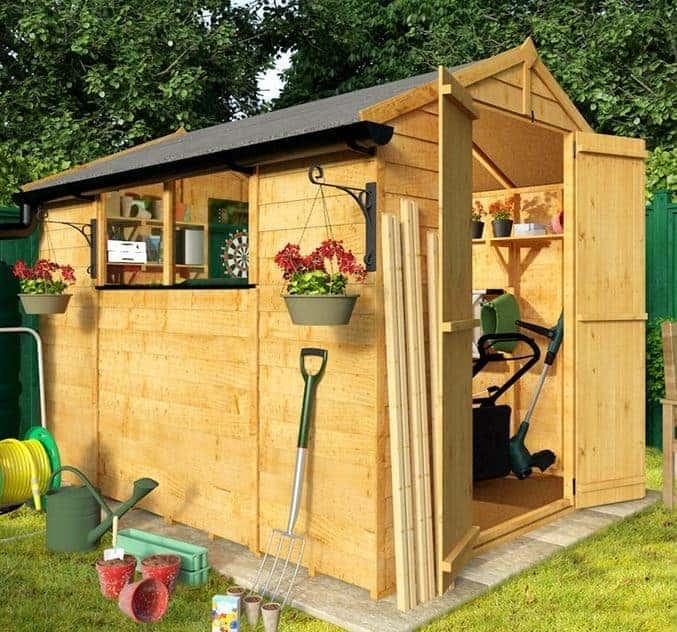 There is also the fact that, while the shed may be small, it is certainly not puny. The double framing means that you have a building that has enough strength to last the distance. 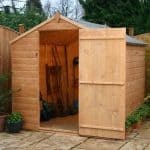 Ensure it is treated so that you get the most out of it and it should prove to be an excellent addition to your garden storage. I have the bily oh 30 12×10 overlap, fantastic size, but all good things end there, quality very poor so many knots in the roof supprting beams 2 strips of which snapped at the knot sections, installation a nightmare if you are out just a little it throws the whole building out at end when putting roof on (I consider myself being good at DIY but i striggled with this) i opted for thr premium t&g floor dont see anything premium about it should have just had the sheet floor instead, alot of basterdising later and its up and alot sturdier than it would have been of i dodnt add extra bits of wood here and there, yes its cheap for size but i wish I’d just paid more for a better quality one in hindsight. The side panels are weak and the doors are shocking. If u get this have some spare 2×2, 1×1 and 3×3 wood as u will need to ised to make right…..its a shame really as if at manufacturing stage they just added a few extra strips here and there ( which is easy at that stage and costs pennies) i would have been much happier.